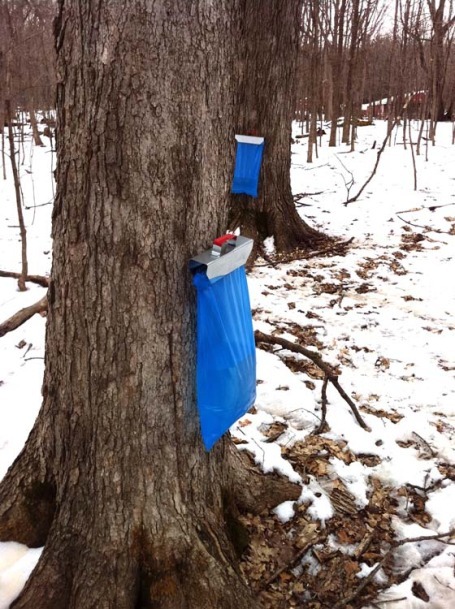 Maple syrup producers are busy again after a sap slowdown during the recent cold spell. In the sugar bush on our property, sap began flowing again in earnest on Tuesday. Wednesday was a banner day, and Thursday promises to be better still. We tap about 35 maples, and put up about 4 gallons of syrup for our use per year. We boil some additional sap, reducing it to syrup, for gifts to friends. I finished two relatively small batches of syrup early last week. Total yield was about 2 gallons. That first sap was very clear, and produced for me a fancy-looking, sweet-tasting syrup. The sap we've collected this week has a slight shade more color to it. Typically, the darker sap produces syrup that carries a more pronounced maple flavoring. Our cooker (below) is far from commercial-grade. But it works for us, and is capable of holding very hot fires. Our primary stainless steel evaporating pan measures 2 feet by 2 feet, with a warming pan above. Sap in the warming pan is dripped by a faucet into the larger pan. With good timing and a little luck, the drip rate roughly equals the rate of evaporation of the sap. My most recent boil was started Thursday morning about 9 a.m., and I expect to boil pretty much through the weekend. It's possible I'll finish a batch sometime Friday, depending on a variety of factors, including my desire to go steelhead fishing. Or it's possible I'll boil straight through the weekend and perhaps evaporate some 200 gallons of sap, yielding 4 or 5 gallons of syrup. A friend, John Weyrauch, of Stillwater, is helping as well. And my two teenage sons are fairly reliable in the sugar bush. They particularly enjoy gathering sap, using our four-wheeler in the woods, which is outfitted with a 35-gallon plastic farm tank for collection. For the curious, my cooker is made of firebrick, with steel framing around the top and bottom. Long bolts connect the two frames, and nuts are tightened down on each end to compress the bricks together tightly. The cooker's door is homemade. 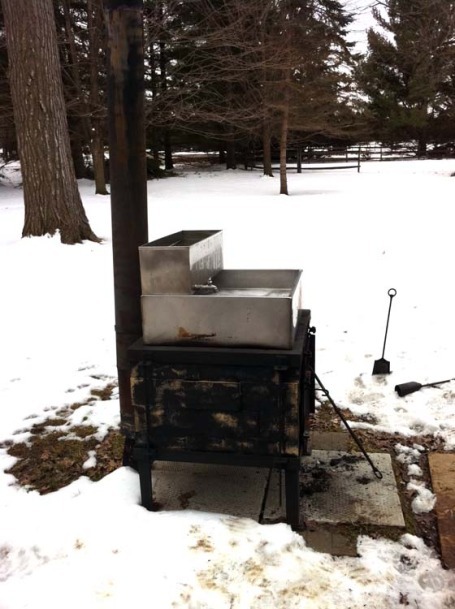 Lon Navis, a fellow syrup lover and neighbor who is a retired 3M pilot, is an occasional welder, and it was his skill with a torch that I leveraged to get the cooker built a year ago.